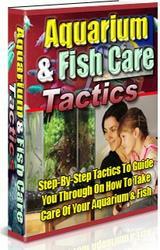 Aquarium plants can also be propagated artificially by means of cuttings, and by dividing rhizomes and rootstocks. 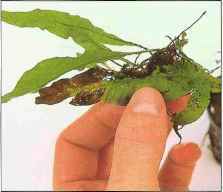 Cuttings All plants with a central stem supporting a number of leaves can be propagated by cuttings. Most stem plants sold either as bunches or potted up are simply top cuttings from established plants. 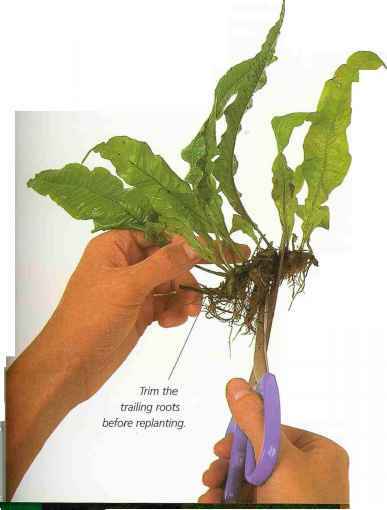 Cuttings can be taken from both the top and middle stem sections, as well as from side shoots. However, the top section of a stem plant includes the growing point and a top cutting is likely to establish more quickly than a cutting taken from other areas of the plant. A normal stem will have a number of nodes (points at which leaves are produced) and these will also form roots if a cutting is taken. Using sharp scissors, take a cutting just above a node, with at least four or five nodes below It. The bottom set of nodes on the cutting will be the area where new roots develop. Carefully remove the leaves on these nodes and plant the stem cutting in the substrate so that the stripped lower nodes are just covered by the substrate. 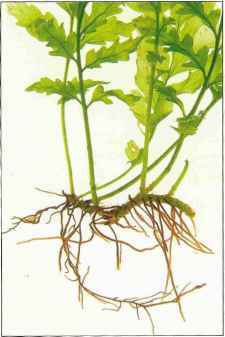 The cutting will start to produce roots and once firmly anchored in the substrate, should start to grow and produce new leaves. The plant that "supplied" the cutting should also continue to grow and may produce side shoots from the point where the cutting was taken. Since taking cuttings from parent plants or regular pruning encourages the production of side shoots, it can also be used as a method of creating a bushier plant. 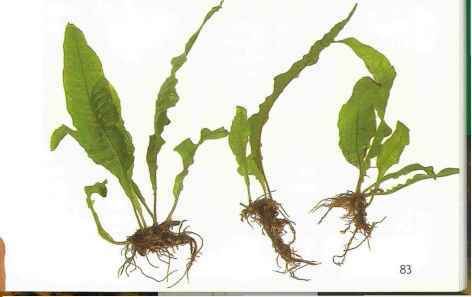 Right: New plantlets with well-developed roots are clearly visible at the tip of this Java fern leaf. You can either separate and replant these or leave them to develop and drop off naturally. Several plantlets may be produced from the same leaf before the leaf dies back. 1 The plantlets underneath this leaf are I well developed, while the mother leaf is beginning to die back to allow the plantlets to drop off. This makes them easier to remove by hand and plant out separately. 2 The new plantlet is now large enough to be replanted. Simply pull it from the main leaf. As the mother leaf is beginning to fall apart, remove it from the main plant and discard it. Otherwise, it will simply rot away. Left: One leaf may produce several plantlets in close proximity. When removing plantlets, check to see how many individual plants there are. Even quite small plantlets can be carefully separated and replanted. Rhizomes A rhizome is a modified stem that resembles a thick root at the base of the plant. 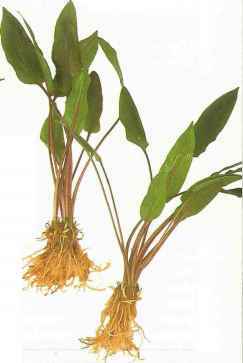 It is often used as a storage organ, as well as for the production of new shoots. 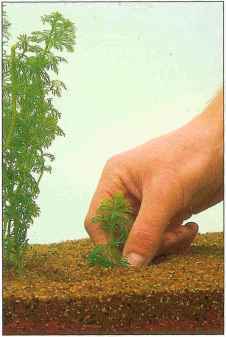 To get to it, you will need to remove the whole plant from the substrate, taking care not to damage the roots. To produce new plants, cut the rhizome with a sharp knife and divide it, ensuring that each division has at least one good shoot. If the original plant or any cuttings or divisions have a large amount of rootstock, trim this to about 1 in (2.5 cm) in length before replanting. Trimming the old roots will reduce the amount of damage caused by replanting and ensures that fresh, new roots develop quickly. Plants that root on rock and wood, such as Microsorium or Anubias species, can be propagated in this way. Using cotton, tie the new divisions either to porous rock or to suitable pieces of bogwood until they have become firmly anchored. Division Plants that grow in clumps will either produce offsets or carry on producing leaves from the main rootstock. If a plant is large enough, you can divide the main root, creating two or more separate plants. Depending on the condition of the rootstock, either pull the plant apart gently or cut it with a sharp knife. Plant the divisions separately and they should develop into healthy new plants. Right: The rhizome of this African fern (Bolbitis heudelotii) is clearly visible. A new shoot to the right of the rhizome indicates that this is the growing end and the best area from which to take a cutting. 3 Push the cutting into the substrate so that the lower leaves are just resting on the substrate surface. Roots should grow from the base and the plant will establish quickly, although lower leaves may die off. 1 To take a top cutting, snip off a length I of stem with several leaves or nodes. Cut between the nodes with sharp scissors. For the best results, take cuttings from the fastest-growing and/or healthiest stem. 2 Strip away the leaves from one or two nodes at the base of the cutting to allow the plant to root more quickly. Roots will form from the stripped node. Make sure it is beneath the substrate when planting. Virtually all stem plants can be propagated by cuttings, taken from both the top and middle stem areas. Taking cuttings is also a good way of thickening up plants, as side shoots are often produced from the main plant as a result of cutting. Cryptocorynes are good examples of plants that produce many offsets directly next to the parent plant. I Start by ' removing the main plant from the substrate. Carry out this procedure with care to avoid any damage to the plant's roots. 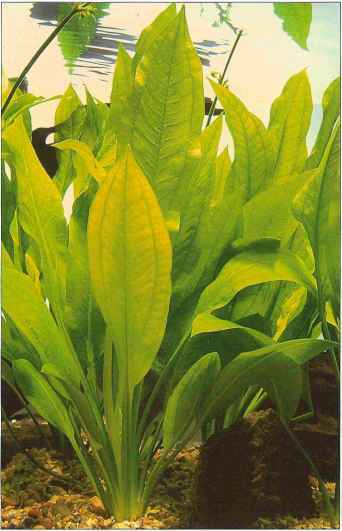 Because Java fern is grown above the substrate, the rhizome is easy to see and division is relatively simple. 2 Separate the leaves to establish the natural divisions within the, plant. 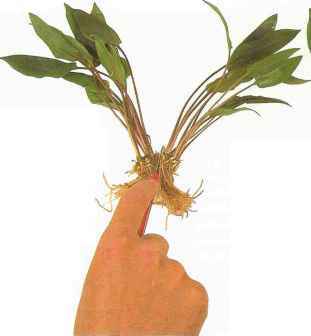 If the roots are relatively untangled, the plant can be separated by hand. 3 Once the plant has been divided, either by hand or using a sharp knife, trim the roots and replant the two separate sections into the aquarium. 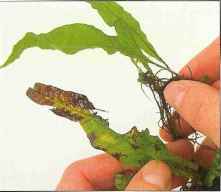 Right: This Java fern can be left to spread across the wood or divided into two, with one half replanted elsewhere W in the aquarium. Below: A good specimen can be divided into a number of plants. As they already have established roots, they should begin to grow almost immediately. Left: Cut the rhizome with a sharp pair of scissors. 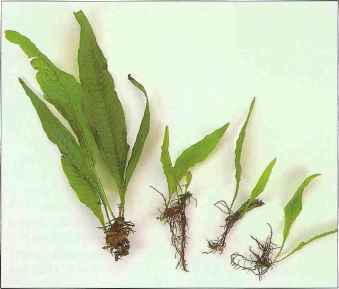 Each division should have at least two or three well-developed leaves, as well as a good root system. 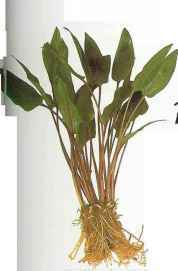 Can cryptocoryne roots be divided and replanted? How to propagate java fern? How to propagate java fern from leaves? 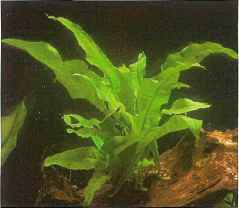 How to plant java fern in aquarium? How to take care of aquarium plants? How to grow java fern? 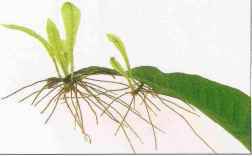 How to trim aquatic plant roots? 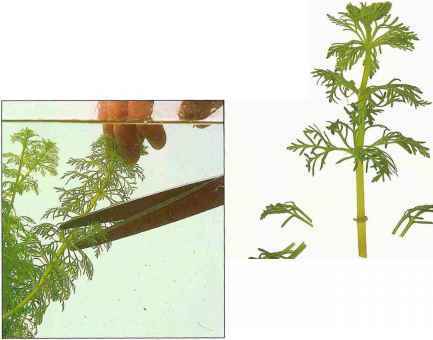 How to cut aquatic stem plants? How to propagate fern plants? How to grow java fern on rock? How do i replant javafern leaf?